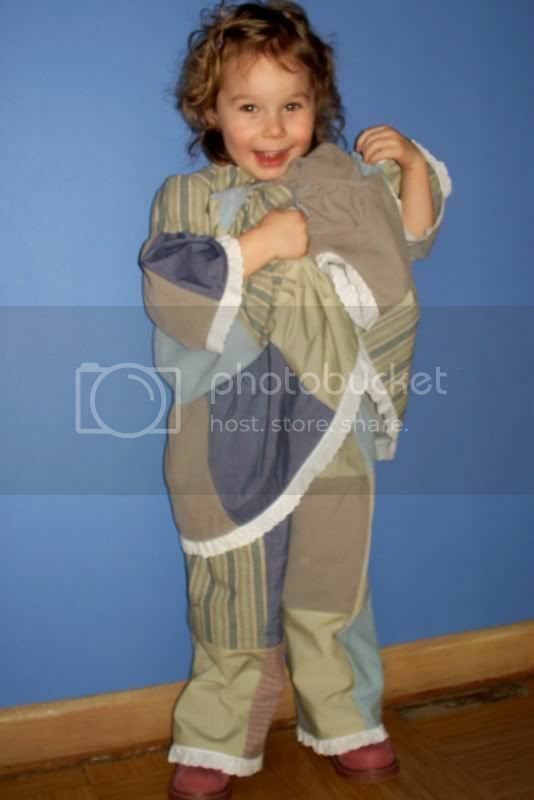 Craftster Community > CLOTHING > Clothing for Kids: Completed Projects (Moderator: meleriffic) > To my child: I'm so sorry! To my child: I'm so sorry! 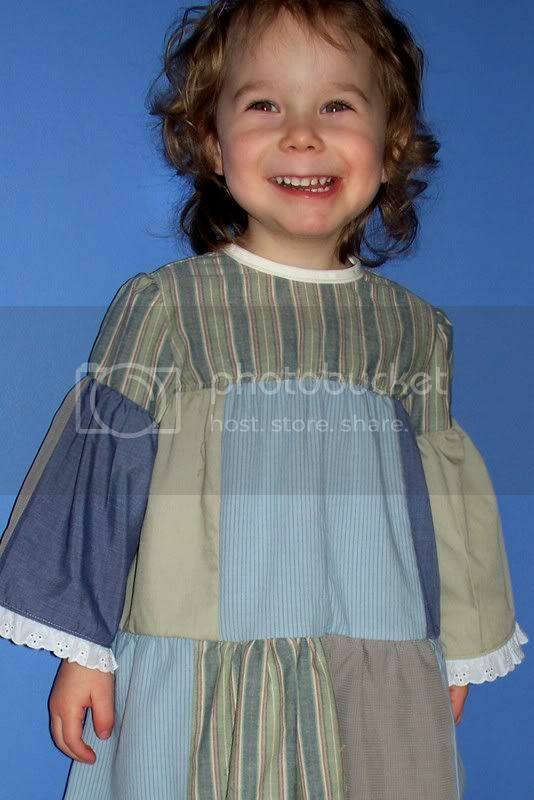 I can only blame pregnancy hormones for this little house on the prairie meets raggedy ann getup my poor, poor child is being forced to wear. Actually, she likes it way mucho, which scares me. But dh has kicked me off patchwork until my hormones straighten out (he says, remember when you make dresses from my old band tees... what has this pregnancy done to your brain?!) As it is, he stopped me before I made a matching bonnet. The whole shebang is made from 2nd hand men's button up shirts, except the very top bodice, which is just a cotton. I was pretty proud to be able to incorporate the shirt front in the back of the dress though, and use the other buttons up the very top. This one, at least, she can get on and off with no problems. Re: To my child: I'm so sorry! I love it really do!!! It's so sweet looking...look at it this way..you can't alway wear rock band dresses just like you can't always wear the same pair of shoes! I think it's really cute. However, I'm not a huge fan of the way the sleeves hang. 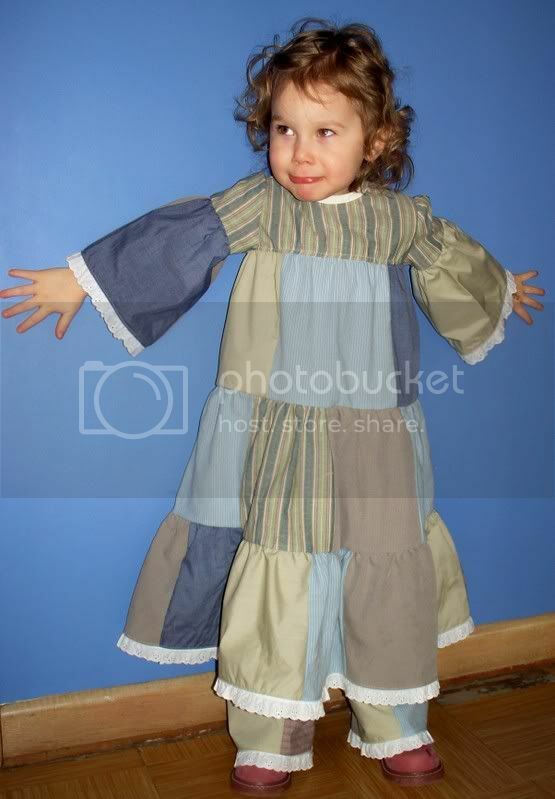 It might be less "Little House on the Prairie" if you give her shorter sleeves, and maybe a more defined waist. I think this project can easily be salvaged from something you hate to something you'll love! Your explanation made my friend and I crack up; you're really funny! My friend said she got her senior picture taken in a dress like that...but backless and with flowers in her hair and no deodorant. So, on the bright side, your daughter's not Holly Hobbie, she's just on the old tried and true dirty hippie path! Way to go mom! Seriously, though, I think this is fantastic and wouldn't change a thing. Wow. That's ... something. I really like the pants, though. So, on the bright side, your daughter's not Holly Hobbie, she's just on the old tried and true dirty hippie path! They want you to take the rolls! While I am a HUGE fan of everything you make for your little sweetie, I'm really partial to this one. This look is pretty "in," right now. I love things for little girls that are pretty and still easy to move around in. This looks comfy and fun. I actually really like this dress. How big are the patches? 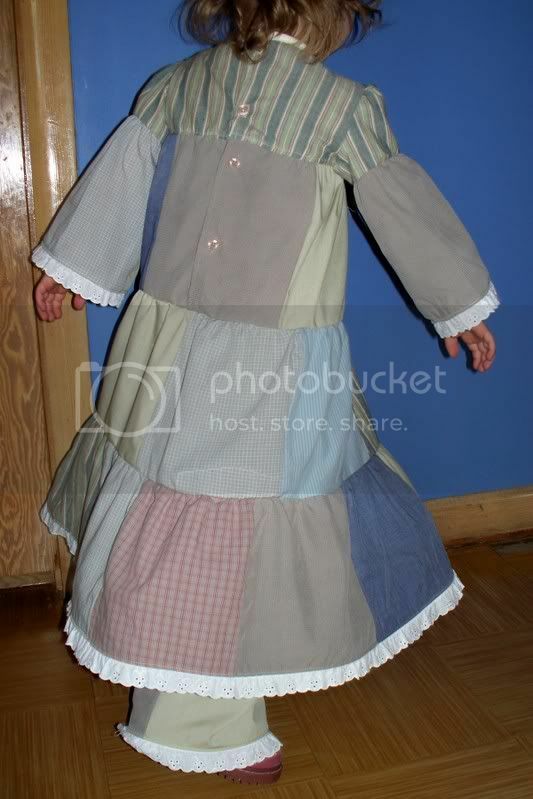 I kinda want to make one but with short sleeves for my daughter as your patchwork circle dress was such a big hit around here.